I bought this car in January of 2002, in Vancouver, Canada. The seller affirmed that I would be able to drive it back to Los Angeles from Vancouver but I preferred to have it trucked. And glad I did. The car was in NO shape to make the drive. (No top !!!) Poor brakes. Clunky front end, unreliable carb and distribution but it looked really nice ! I paid US$20,000 for it so he got $31,000 Canadian dollars. I guess we both made good on the deal. I had the front end redone, the timing, the brakes, the exhaust system replaced from the manifold out, a brand new cloth top and tonneau cover. It has a Holley Carb mounted on an Edelbrock manifold. I'm registered with C.A.T. in California. Back in the 60's, when we lived in France, my dad was the general sales manager for Rootes-France in Paris, on the Champs Elysees. He mostly sold to the US GI's who were stationed there until General DeGaulle ousted them One night, he brought back home one of the first Sunbeams ever. As kids, my brother and I got really excited. Up until then, Dad had been driving home each of the Rootes cars, one after the other if he had to show them to clients the following day. We'd always find them rather uneventful, although very different than the current french cars. But since I learned to drive on a Hillman Minx, I guess I got accustomed to their oddness; and I'm still fond of their "on-the-column" gearshift. One day he brought back this funny-looking Sunbeam shaped like a station wagon... It was a Harrington - with white-wall tires no less ! And then on another day the first Tiger in which he would drive us to school. I got hooked way back then. One of the last Sunbeams he brought back home was the Venezia. My mom loved that one almost more than the Super-Snipe she drove once in a while. My brother and I would go around the it counting how many parts from other Rootes cars the Venezia included ! 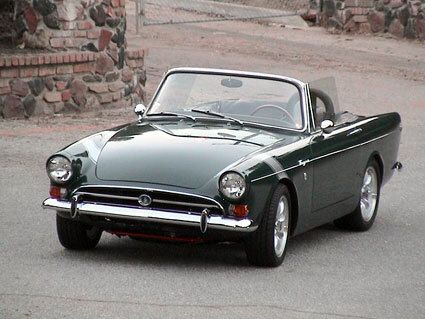 Dad's last Sunbeam in 67 was a really nice dark blue automatic. He drove that one until he left Rootes.